Meet HERO. With a touch screen and durable waterproof design, it's easy to score awesome shots of any adventure. Or use it to capture everyday things from creative new perspectives. Your moments move right to the GoPro app and transform into amazing videos, automatically (1). Wherever life takes you, capture and share your story with HERO. (1) Quikstories requires the GoPro and Quik mobile apps, available free for iOS and Android. To create a QuikStory, your HERO must be connected to the GoPro app. (2) Auto offload to your phone requires your HERO to be connected to the GoPro app. 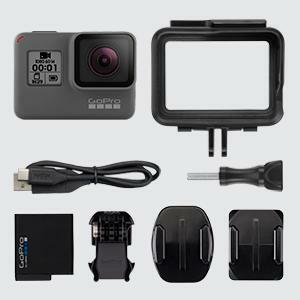 (3) GoPro Plus is a subscription service available in select territories. Cancel anytime. To back up photos and videos to the cloud, your HERO must be connected to the GoPro app.